Drink up! But be conscious of your choices. Aside from providing a performance-boosting caffeine jolt, both drinks are rich in antioxidants. Studies show that tea drinkers have a lower BMI, waist size, and body fat percentage than those who don’t drink it. Regular coffee consumption may stave off diabetes, heart disease, and even Alzheimer’s disease. Drink a cup of tea or coffee 45 minutes before a run for an energizing boost. Pure, simple, and calorie-free, water should be your go-to choice for hydration. But when you’re running long and feeling drained, sports drinks are ideal. They contain electrolytes and carbs that facilitate water absorption and help prevent fatigue. The added sodium helps your body hold onto fluid and prompts you to drink. Water is great anytime. Use sports drinks on runs 60 minutes or longer. For short runs, try swishing sports drink in your mouth, then spit it out–this may boost performance without adding calories. Chocolate Milk–or Wine (or Beer)! Okay, maybe alcohol shouldn’t top the list, but wine and beer do supply beneficial phytonutrients. Save the postrace toast for after you’ve recovered, and opt for chocolate milk instead. It has a nutrient mix that leads to better muscle protein production than carb-only drinks. Mix up choco milk after long runs or speedwork. Stick to (at most) one or two alcoholic drinks per day. 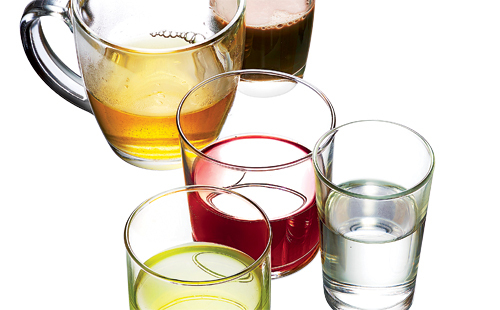 These vibrant juices are made for runners. Tart cherry juice packs antioxidants that reduce inflammation and improve recovery. Drinking beet juice prerun can increase nitric oxide production and improve bloodflow, allowing muscles to perform more efficiently. Drink either juice once or twice a day during periods of hard training; or try two cups of beet juice 90 minutes before an intense run. Trendy coconut water has slightly fewer carbs than sports drinks. Maple water (the watery sap from maple trees) is less well known. It’s mildly sweet, with just 15 calories (and some minerals) per eight ounces. Refuel with coconut water postrun. Try maple water on shorter runs.